I have been homeschooling since the late 1990’s, I was first introduced to the Principle Approach in 2007 through the Foundation for American Christian Education. I purchased CHOC I, T&L and James Rose’s Guide to American Christian Education, and I began to study. But at the time, I had children in 1st, 4th, 6th, and 8th grades, and a newborn. As you can imagine, I felt quite overwhelmed! I struggled for the next few years trying to implement PA in our homeschool. 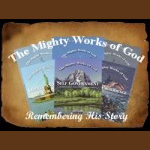 Last year, I purchased The Mighty Works of God: Divine Providence. Although you wrote this book for upper elementary/early middle school-aged children, I used it as the spine for all four of my school-aged kids (5th-12th grades). The Teacher’s Manual to Divine Providence helped me see how to apply PA to a lesson. I was able to take the leading idea from each lesson and expand it for my older children using additional readings, sometimes even having them read from the Teacher’s Manual. On many occasions, we decided to delve deeper into a lesson and do additional research. 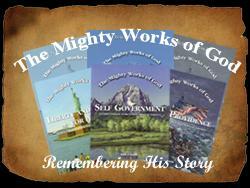 Divine Providence gave me a basic curriculum from which to work. You identified principles and leading ideas and provided questions for reasoning and reflection. As a busy mother of several children, this was a HUGE time saver. I didn’t have to develop all of my lessons from scratch. The CD of notebooking pages was another timesaver. Because I was teaching older children, I didn’t always use the pages provided on the CD, but the CD at least gave some ideas regarding what should be recorded in our notebooks. I believe that many families are drawn to the Principle Approach because they want to teach their children to think and reason from the Bible. But because this is not the way the parents were taught and because often these families already have several school-aged children, they are overwhelmed and intimidated by the Principle Approach. It takes time to learn the principles and how to extrapolate leading ideas from lessons. That’s why I believe the Teacher’s Manuals to The Mighty Works of God series are so valuable. They take the edge off of the intimidation factor. 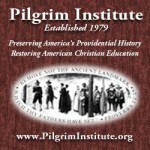 I believe that the Pilgrim Institute would do a great service to the homeschooling community by producing additional series such as The Mighty Works of God focusing on other eras in history, and perhaps even on other subjects. Thank you for the opportunity to share my thoughts. May God bless you and give you wisdom in your future endeavors.